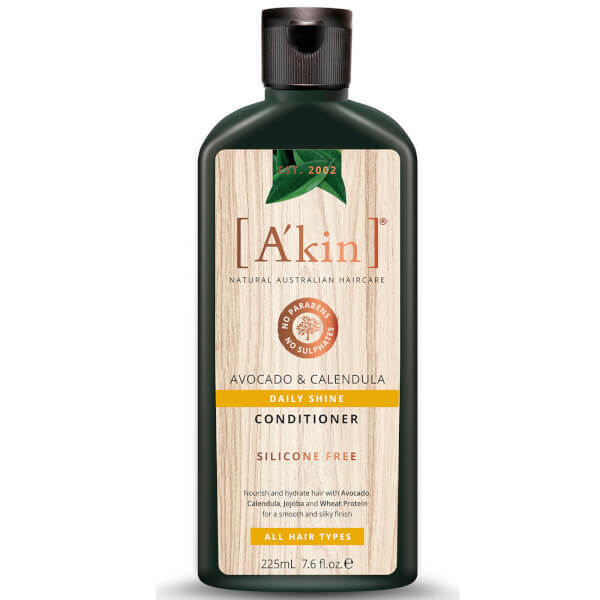 Catering for all hair types, the A'Kin Daily Shine Avocado & Calendula Conditioner restores softness and salon-worthy shine from root to tip. Infused with Wheat Protein and a nourishing blend of Avocado, Jojoba and Calendula Oils, the weightless formula delivers long-lasting moisture and hydration, whilst effectively detangling and eliminating frizz for a super sleek finish. 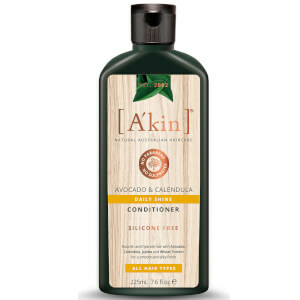 Expect smooth, healthy-looking locks that feel naturally silky and glossy. After shampooing, massage into wet hair and scalp and rinse thoroughly. Aqua (Purified Australian Water), Glycerin*, Cetearyl Alcohol*, Behentrimonium Methosulfate*~, Hydrolyzed Wheat Protein*, Macadamia Ternifolia Seed Oil*, Persea Gratissima (Avocado) Oil†, Simmondsia Chinensis (Jojoba) Seed Oil*, Lecithin#, Glyceryl Laurate*, Sodium Gluconate*, Potassium Sorbate, Citric Acid*, Pelargonium Graveolens (Geranium) Flower Oil*, Glycine Soja (Soybean) Oil*, Pogostemon Cablin (Patchouli) Oil*, Eugenia Caryophyllus (Clove) Leaf Oil*, Elettaria Cardamomum Seed Oil*, Calendula Officinalis Flower Extract*, Tocopherol*, Ascorbyl Palmitate*, Hydrogenated Palm Glycerides Citrate*, Citronellol*, Geraniol*. *Derived from botanical sources. #GMO free. †Certified organic.